Results: More than 100 years since superconductivity was discovered, a comprehensive description for the behavior of a broad class of fundamental physical systems that exhibit the bizarre properties of superconductivity and superfluidity has been developed. Superconductivity and superfluidity are quantum mechanical phenomena in systems composed of a very large number of microscopic particles that can be observed with the "naked eye." Remarkable features of these systems include electrical flow with no resistance, or special fluids that creep up the sides of a container and overflow with no external influence. When a superfluid is rotated or swirled, it develops cylinder-like vortices. In their paper featured in the June 10 issue of the journal Science, a team of scientists, including Pacific Northwest National Laboratory's Kenneth Roche, describes how these vortices form and evolve microscopically at very low temperatures in fermionic gas systems. 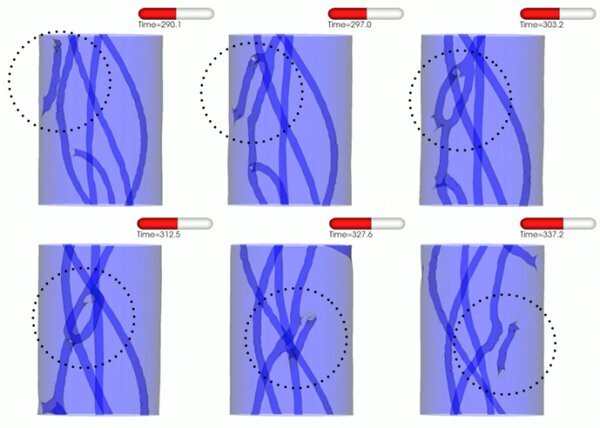 They also describe the quantized vortices as they cross and reconnect. The team's simulations show that, in many instances, the system remains superfluid even when stirred at supercritical speeds, in contrast to a decades-old hypothesis that predicts the system would lose its superfluid properties under these circumstances. Why it matters: The methods developed will open new avenues of research both in nuclear physics and astrophysics, as well as in condensed-matter and related fields. These methods can now be used to study various properties of atomic nuclei, ultra-cold gases in traps and optical lattices, induced nuclear fission, vortices within a neutron star's crust, the onset of quantum turbulence and high-temperature superconductivity. Methods: The team developed an extension of the time-dependent density functional theory (DFT)—a method originally used in quantum chemistry and physics to study the electronic properties of molecules—for fermionic systems. Unlike a bosonic superfluid, the new mathematical framework needed for a fermionic superfluid is about a hundred thousand times more complex. To evaluate this extremely complex formulation, the research team turned to one of the world's fastest supercomputers, the Jaguar PF, a Cray XT5 system at the Department of Energy's Oak Ridge National Laboratory in Tennessee. Roche led the effort to develop software that allowed Jaguar to run the team's challenging calculations. What's next: The team is studying the onset of quantum turbulence, the pinning and de-pinning mechanism of vortices on "defects" in a real-time dynamics, and the dynamics of exotic pairing mechanisms such as the Fulde-Ferrell-Larkin-Ovchinnikov phase. For nuclei, the team plans to study induced gamma and neutron induced fission processes and to lay the foundation for extending the deterministic superfluid DFT to a stochastic quantization of the theory amenable to many-body collective tunneling. These calculations will only be possible on exascale and beyond computing platforms. Acknowledgments: PNNL's participation in this research was funded by the Department of Energy's Office of Science. More information. Research Team: Aurel Bulgac and Yuan-Lung Low, University of Washington; Piotr Magierski, Warsaw University of Technology; Kenneth Roche, PNNL; Yongle Yu, China's Key State Laboratory of Magnetic Resonance, Atomic and Molecular Physics. Reference: Bulgac A, Y-L Luo, P Magierski, K Roche, and Y Yu. 2011. "Real-Time Dynamics of Quantized Vortices in a Unitary Fermi Superfluid." Science 332(6035):1288-1291. DOI:10.1126/science.1201968.